I do a lot of reading about different methods of oil painting, and experimenting with different colors. “The Bee” I decided to do a wash of color on my white canvas. I first sprayed Gamsol on my canvas. With my brush I started sketching in my sunflowers and leaves. I washed in the colors so to cover the whole canvas. Using mostly transparent colors, reminded me of my old days using watercolors. The Gamsol, which is very lean, allowed me to quickly apply the colors “in no time” the canvas was dry. A few hours later I was able to start laying in my colors. Neo Megilp was the medium used for blending in my details smoothly. Using transparent colors takes longer because you have to layer more, but it gives the painting a clean brilliant look. After each layer dries (2 days) I start another layer until I get the effects I want. My new go to greens are Winsor Lemon (cool) and Winsor Blue, green shade (cool). They both have green in them so they make wonderful mixtures of greens. A new mixture gives me an incentive for painting. I still use my wonderful mixture Hansa yellows (light, medium, and deep) and Phthalo Blue. The many greens in nature make the search for a wide variety of greens crucial. My new go to oranges are Winsor Yellow (warm) and Gamblin Perylene (warm). With this mixture I can create a variety of oranges. I also used radiant white and Gamblin Hansa Light (cool) for the tips of the petals. The center of the sunflower is Gamblin Pink Brown with some orange around the outer edge of the seeds and the center part of the seeds pink brown and Dioxazine Purple. Radiant White was used to lighten the seeds. 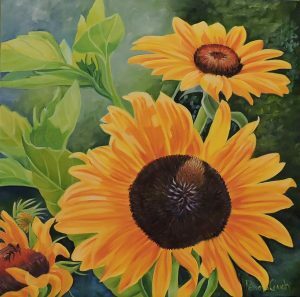 Painting sunflowers is always a challenge. They are so bright and beautiful I want to desperately capture my excitement for these happy flowers that I grow every summer. I joined a new gallery, B3 Gallery, 61 W. Main St., Nashville, IN. My next show (indoor) will be in South Bend Century Center, “For the Love of Art” March 2,3, 2019.